Historically, studies of the church in Africa have tended to focus on church history or church-state relations, but in this publication David Zac Niringiye presents a study of the Church of Uganda focused on its ecclesiology. Niringiye examines several formative periods for the Church of Uganda during concurrent chronological political eras characterized by varying degrees of socio-political turbulence, highlighting how the social context impacted the church's self-expression. The author's methodology and insight sets this work apart as an excellent re ection on the Ugandan church and brings scholarly attention to previously ignored topics that hold great value to society, the church, and the academic community globally. 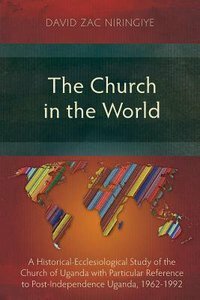 About "The Church in the World: A Historical-Ecclesiological Study of the Church of Uganda With Particular Reference to Post-Independence Uganda, 1962-1992"